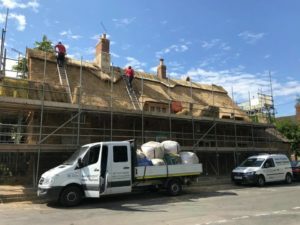 The team enjoyed the sunshine while putting the finishing touches on this impressive and large cottage in Braunston-in-Rutland today. This job has been a slight marathon with holdbacks from the great British weather and other setbacks. 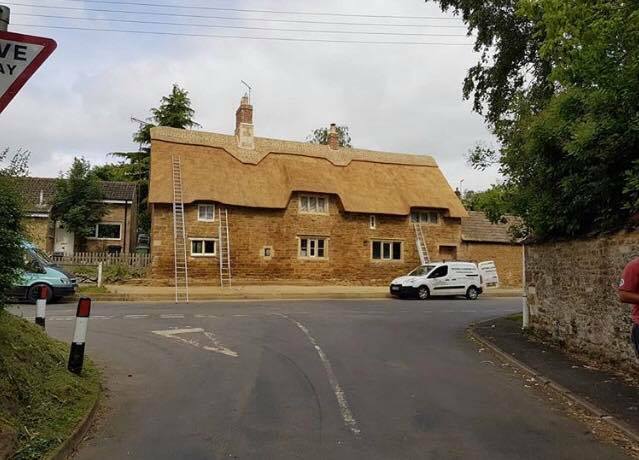 When the best from the east hit the UK, our scheduling was hit too and most jobs were affected, including this Re-Thatch and Re-Ridge. We also had to wait for other trades to finish their jobs before we could start on this property. This was a full re-thatch and as it was a large roof it took a good chunk of time, but we’re extremely pleased with the outcome, as were the owners. 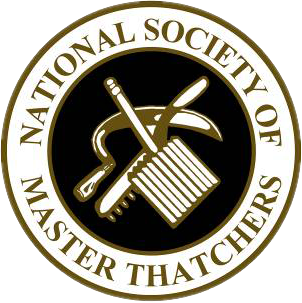 Here at Heart of England Master Thatchers, we provide Roof Thatching in Rutland as well as across Leicestershire. Every thatch property will need a full re-thatch, depending on the type of straw used will determine when you need a re-thatch. Combed Wheat Reed will last roughly 25-35 years whereas Long Straw will last around 15-25 years. Having a re-ridge will protect your roof between re-thatches. If you like the work we have done, please don’t hesitate to get in touch with us.